← Four years after Palin: Will Virginia love Ryan? It was good to get away from planet Washington before the election season swings into full gear. And it was an even better idea to choose Portland, Oregon, as the destination for this last escape from Super PACs, union strikes and Tea Party rallies. This charming city on the outer edges of the American universe makes it easy to forget the Beltway’s partisan rancor. There are no competing visions here. Portland has made its choice. No matter who wins the national election – its somewhat geeky, eco-conscious citizens will be busy comparing the newest vegan restaurants, discussing the benefits of different recycling methods, planning the weekend’s outdoor activities or analyzing the results of the annual Soapbox Derby on Mount Tabor. The dueling ideologies, which divide this country, will soon be on display at the Republican and the Democratic conventions in Florida and North Carolina. Both parties will vie for the elusive “swing voters”, while most Americans have long decided that it is useless talking to the idiots on the other side. So maybe Portland has it right: Gather hippies, techies and environmentalists in the Pacific West and leave religion, red meat and fossil fuels for places like Lubbock, Texas. The author Chuck Thompson has recently created a stir with his proposal for dividing North and South along the front lines of the Civil War. The book is a sloppily written collection of prejudices and lame jokes, but the fact that it was reviewed in most major U.S. publications shows that it struck a nerve. As far as the West Coast goes, the idea of an independent Republic of Cascadia, consisting of Northern California, Oregon and Washington, first gained international fame through Ernest Callenbach’s “Ecotopia”, which was an inspiration for the German Green Party in the 1980s. Portland is Ecotopia – and its citizens never miss a chance to point out its ecologically advanced state. On your way through town, they will make sure you pass multiple bicycle parking lots and the glass recycling factory, as well as the nation’s first LEED certified homeless shelter. “All our materials are produced locally,” is the standard greeting of any Portland shop assistant – no matter if they sell groceries or clothes. When watching the first season of “Portlandia” I had dismissed a scene in which the guests in a restaurant ask the waiter whether the chicken on the menu had a happy life, as a gross exaggeration. Now I know that this is exactly how it could have played out. Quality is always writ large in Portland. Forget Whole Foods – Portland’s New Seasons Markets offer better organic produce, and better prices. Forget meat – I didn’t even miss it when we had the special tofu scramble at New Deal Café for breakfast, crispy veggie burgers at Little Big Burger for lunch and a vegan dinner at The Bye and Bye on North Alberta, followed by a scoop of lavender-honey ice-cream at Salt & Straw. In between we had espressos in some of Portland’s gazillion coffee shops and browsed through the mind-blowing collection at Powell’s City of Books, a downtown institution. At a time when people in Lubbock, Texas, were probably doing their weekend shopping at Walmart, we watched Portlandians ride creative self-built ‘soapboxes’ down a hill. 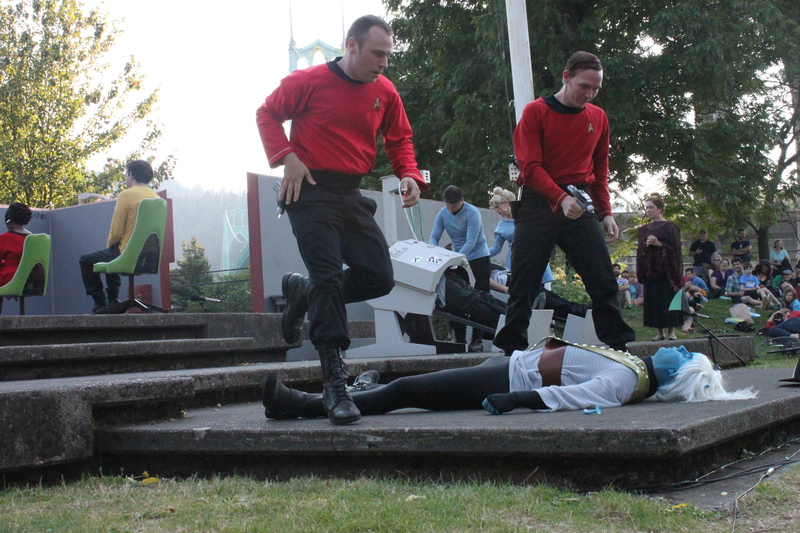 And while Lubbock went to the movies, we were entertained by Trek in the Park, an annual open-air reenactment of the Star Trek series. In this year’s installment, “Journey to Babel”, Captain Kirk and Mr. Spock prevent the hostile takeover of the Coridan planets for their precious metals. Portland, you are adorable. But back East on planet Washington, I feel ready for some red meat again. Let’s see if I can squeeze in a fast food dinner at Ray’s Hellburger or Ben’s Chili Bowl before moving on to hot weather and even hotter arguments in Tampa. This entry was posted in Americana and tagged Cascadia, Ecotopia, Portland, Portlandia, Trek in the Park. Bookmark the permalink.